Did you know that your Mac has a powerful suite of built-in sharing tools? Some of them are pretty straightforward, but others could used a bit more explanation. On today’s episode, we’ll cover the macOS Sharing Preferences: what you can do with them, and the potential impact they can have on your Mac’s security. What happens if you forget the password for your Mac? The good news is, your data is safe… the bad news is… you can’t have it. Luckily, there’s a lot you can do to try to get back into your Mac if you’ve forgotten your password. We’ll look at some of those on today’s Checklist. Most people already have shadow profiles on social media platforms, and they didn’t even set them up… because that’s not how they work. On today’s show, we’ll take a closer look at what Shadow profiles are, how they’re used, and the potential privacy concerns they raise. Spring is here, and you know what that means… It’s time for some spring cleaning! Over time and with continuous use, your hard drive can end up just as messy and disorganized as a lived-in home after a long winter. On today’s episode we’ll cover steps you can take to clean up and organize your Mac! As helpful as the convenience of storing data in “the Cloud” can be, there are lots of examples of problems with cloud services causing disruption for individuals and for businesses. What happens when “the Cloud” goes bad? That’s our topic for this edition of The Checklist. We’ll look at problems you might encounter when using iCloud, as well as some of the broader issues with cloud computing in general. Encryption is big news today for security professionals and regular users as well. As more and more people are concerning themselves with keeping their communication secret, a large number of encrypted messaging apps are hitting the scene. How do you pick one? And what do you need to know about them? When you know where malware is most likely to be found and how it’s most likely to attack, you can take steps to avoid it. From email attachments to hacked websites, malware lurks in a number of places. On today’s episode, we’ll look at how malware is distributed: the means, the methods, and the most effective ways to mitigate the risks. When you suspect your Mac is infected, it’s important to take steps to find and fix the problem before the issue becomes severe — or worse, before your personal information is stolen. On today’s episode, we’ll look at the process you should follow if you think your Mac is suffering from a malware infection. The last few months of 2016 were kind of quiet in terms of sightings of new Mac malware, but maybe that was just the calm before the storm. 2017 has already seen a plethora of newly discovered malware targeting the Mac. 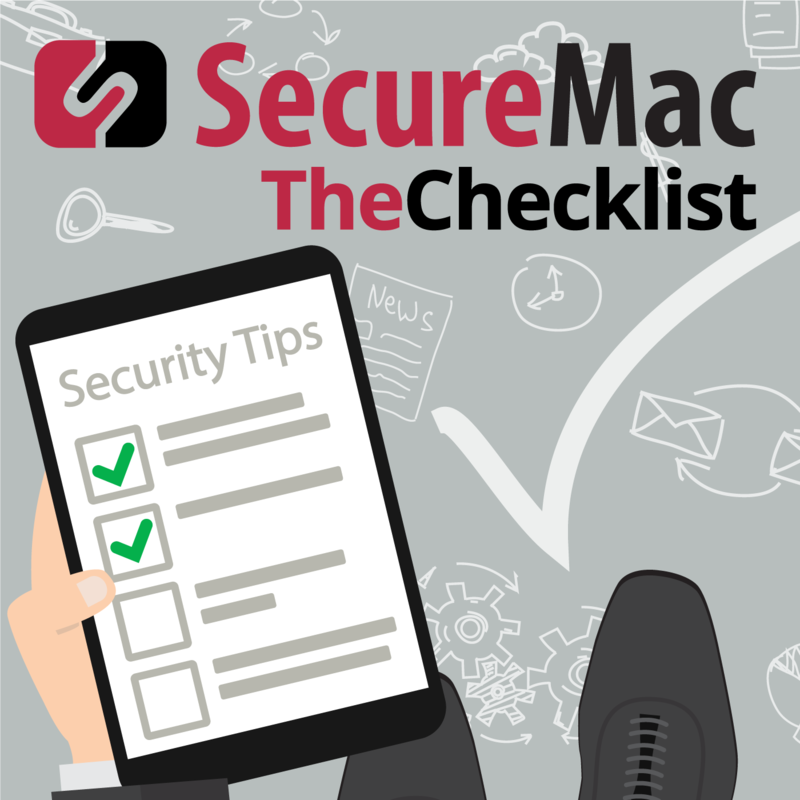 On today’s Checklist we’re covering five recent Mac malware threats and a bonus item: How to minimize those threats. The internet is an important fixture in our lives, but definitely comes with some potential paths to hazards and threats, especially for kids. So what can you do to keep your kids safe? If you’re using a Mac – or if your child is, Apple includes a lot of tools in macOS that can help out. Today on The Checklist, we’ll look at five of the most important things to know about built-in parental controls on your Mac and how to use them effectively. Just about everyone has a smartphone these days, and many parents see the benefits in providing their children with a phone to keep in touch, or in case of an emergency. Smartphone also make it easier for children to be exposed to cyberbullying or inappropriate content, so how do you keep a child safe on the phone? We’re going to explore this topic more in depth on today’s episode! The files on your Mac are more than “just data” — they’re your music, your vacation pics, that report that’s due for work or the video of your child’s first steps. On today’s episode, we’re going to cover specific steps you can take to keep your data safe and secure from prying eyes. Beyond social media and online shopping sites, there’s a whole lot to the Internet that the average user simply can’t see. We’re talking, of course, about the so-called “dark web” which is only accessible with the Tor Browser. On today’s episode, we’ll be discussing this hidden side of the internet, and the special browser needed to access it. On today’s episode of the Checklist podcast, we’ll run down some of the security apps which are “must-haves” for any user. We’ll cover what these apps do, what sets them apart, and why you’d be wise to have some of them installed on your Mac. On this podcast we frequently talk about the various “digital” defenses that you can set up to protect your Mac and iOS devices. Physically securing your devices is equally important, especially when it comes to protecting your data from prying eyes and grabbing hands in the “real world!” In today’s edition, we’ll cover what you need to know about physical security and some things you can do to improve your device’s safety. VPNs (Virtual Private Networks) are one way you can take matters into your own hands and improve your privacy online. On today’s show, we’ll go over exactly what these are plus how you can use them on your Apple devices. Last week we took a look back at the defining moments in 2016 for Mac security, and this week we’re giving iOS the same treatment! A lot has happened in the past year, and we’ve got plenty to cover in this episode! The past year has seen threats new and old targeting Mac users, but it has also seen some significant progress from Apple when it comes to security. On today’s episode, we’ll be covering some of the top Mac security stories that you might have missed over the past year. There are many different ways that websites and advertisers can track your online browsing habits. In today’s episode, we’re covering 5 ways websites are tracking you, why they’re doing it, and what it means for online privacy. It seems like new malware attacks are in the news just about every week. A recent ransomware attack crippled San Francisco’s public transit system, with far-reaching consequences. In today’s episode, we’re going to cover four important things you should know about the Muni hack.